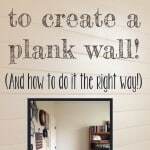 I’ve wanted a plank wall in our house for a while now. I did tons of research and wanted to try an economical DIY way instead of buying the wood planks that snap together. Some of the materials I researched were not in our local Home Depot or Lowes. 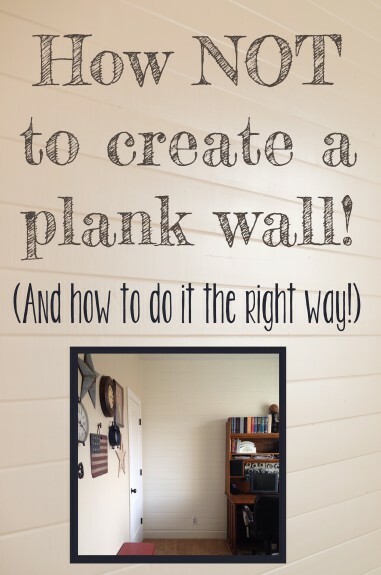 But quite a few tutorials used tempered hardboard. It was cheap and Home Depot would cut it for free. 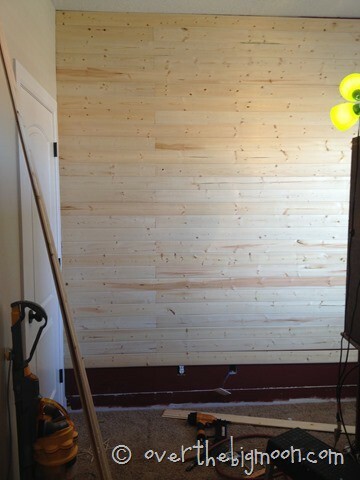 Our wall needed 3 boards and cost us just over $30. 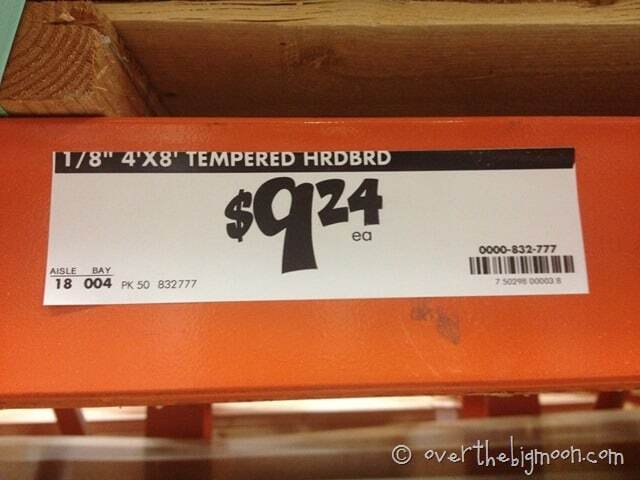 We bought them and the good guys at home depot cut them for us. 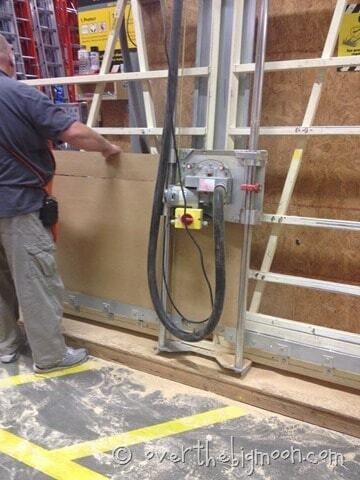 Here is the problem – the saw doesn’t keep the wood flat and so the boards are not perfectly straight. They kind of bow. John and I persevered and were going to still go for it. But after the first row we didn’t feel like they were very sturdy and we were terrified that if we kept going we would regret it later. So it was back to Home Depot. 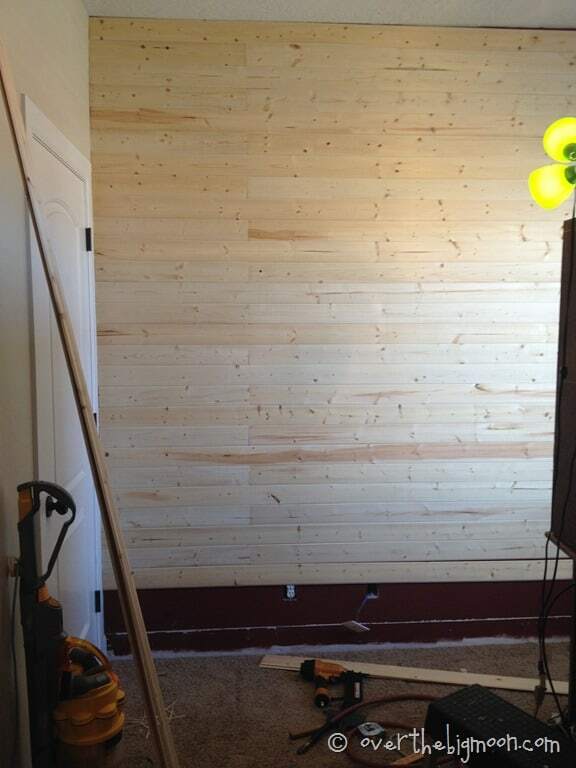 We decided to just go for the tongue and groove planks. Cost this time $160. Not horrible but definitely not $30! But once we started working with them we decided it was worth the extra $130! Miter saw – this is the exact one we bought and I love it! The first board is definitely the most important. 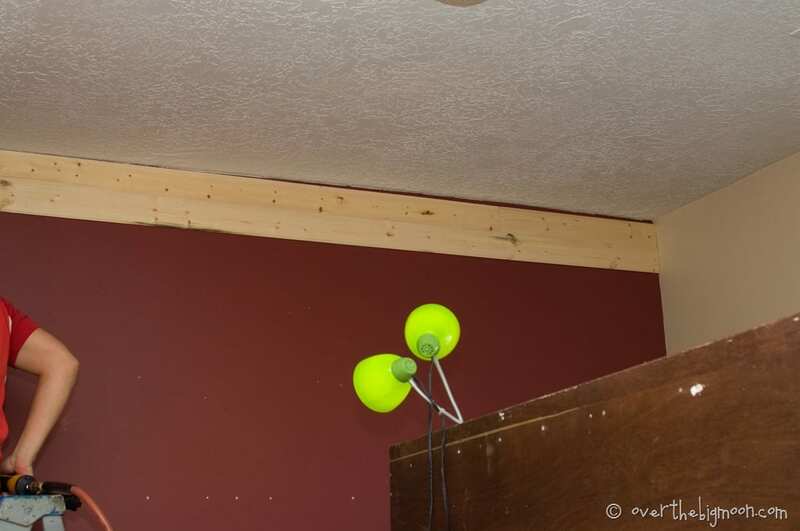 It’s going to shock you how not straight your ceiling is. Don’t put your board along the ceiling. Make sure it is straight according to your level! Check out how bad our ceiling was. Once you have it straight you can continue to put the rest of the boards up and not have to keep using your level. Another important tip is to try to nail into the studs. Studs tend to run every 18 inches. So we put a nail in as close to the corner as we could and then we measured 18 inches to put the next nail in. Then keep continuing with the boards. Once we had the first row in we knew where to nail next and didn’t have to measure anymore. When you are all done its time to caulk. Get ready for the long haul here. I watched a couple movies during the hours it took me to do it. First caulk the top. I did 1 big fill in and let it dry and then did a finish caulk to make it super smooth. It looks funny caulked but when you paint it it’s not noticeable. I also caulked the cracks in the seams and big knots. I put caulk in the holes with my finger and then use a razor blade to scrape it smooth. It’s very messy! Then comes the sanding. 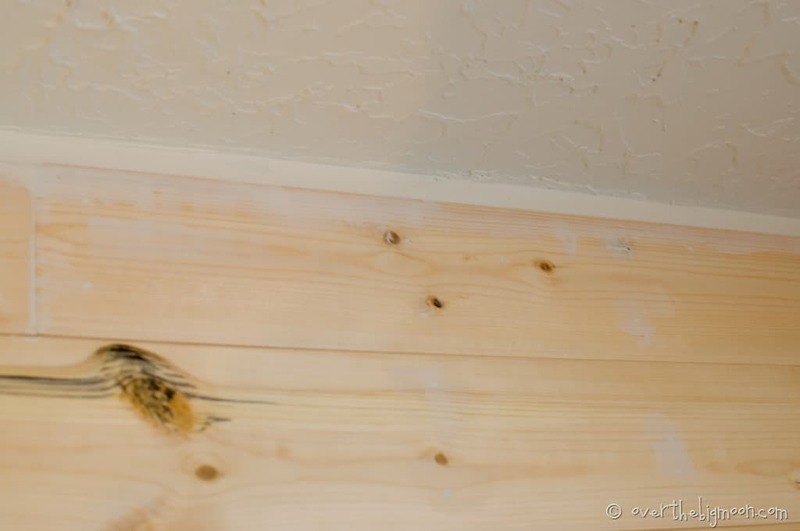 No matter how careful you are caulking you are going to have extra bumps. 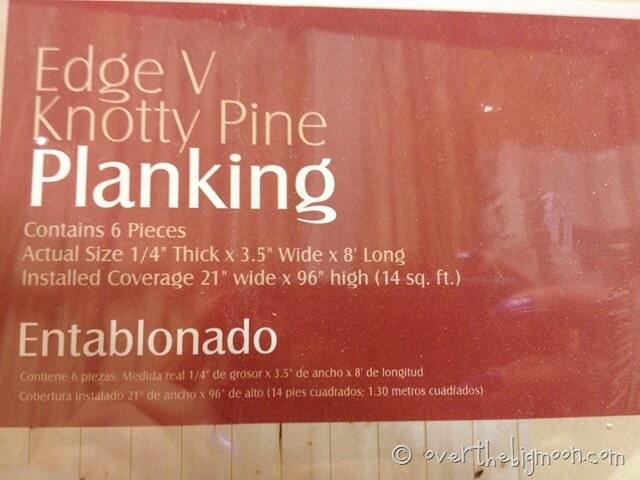 Use a very fine sandpaper and sand the heck out of every board. I have recently discovered tack cloth. Its my new painting staple. 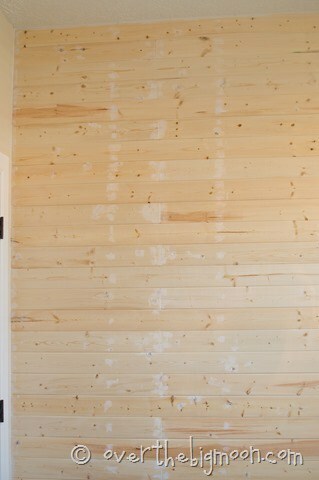 Use tack cloth to wipe the boards clean so you are ready to paint. Then paint it up! 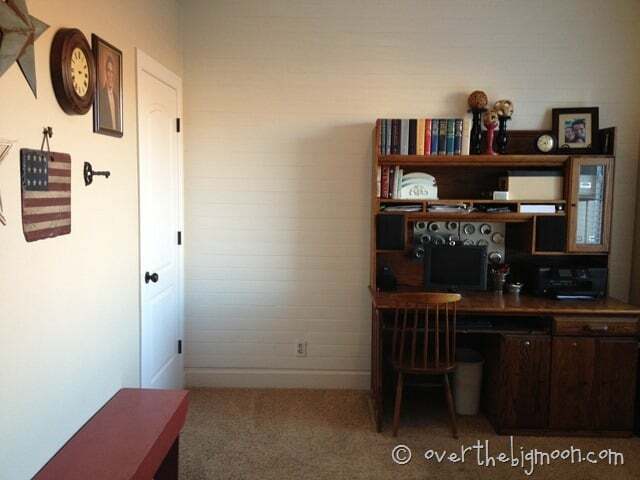 I was trying to find a before picture of our office for comparison. I cannot ever remember to take one! It really lightened the room up. Dejunking also played a big part in the room overhaul. One of my good friends Carly gave me the best advice and I don’t even think she knew she was giving it. In talking about her house and junk she said, “I mean really how many pens do we need.” But if you know me or my Mom you would understand that we have a love affair with office supplies. I love them – I love to have them, collect them, and hoard them. It was a big deal for me to get rid of a lot, but I love it. What did I learn? Yes, sometimes cheap is a good way to go, but on a big project sometimes a little extra is worth it to do it right. I love it! 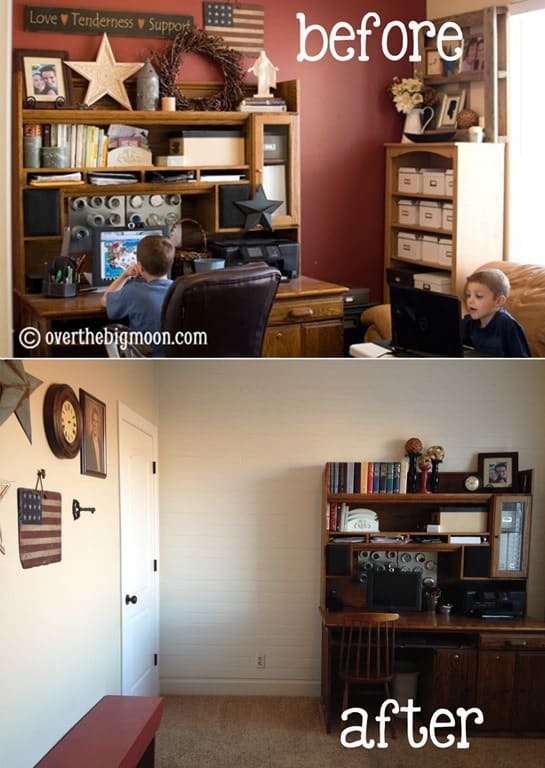 I’m planning on doing this to the back side of my kitchen cabinets that are visible from our family room. I’ve been hesitant due to the uneven measurments I’m going to have to deal with. Your post has motivated me to get off my bottom and do it. Thank you! Looks great, but one more comment if I may, if you were to do this again, have the people at HD set the saw to your depth at the bottom of the saw, not the top. One, you only have to set it once and just keep running through the boards. Cut the same every time instead of measure, cut, measure cut. And two, the weight of the boards will keep them flush as they are pushed through the saw. The guys at Lowes did it that way and didn’t charge me. Spent $40 on laminated plywood, ran three sheets through at once and was done in no time! Nice project. Here’s some other tips. Studs are generally 16″ on centre not 18. 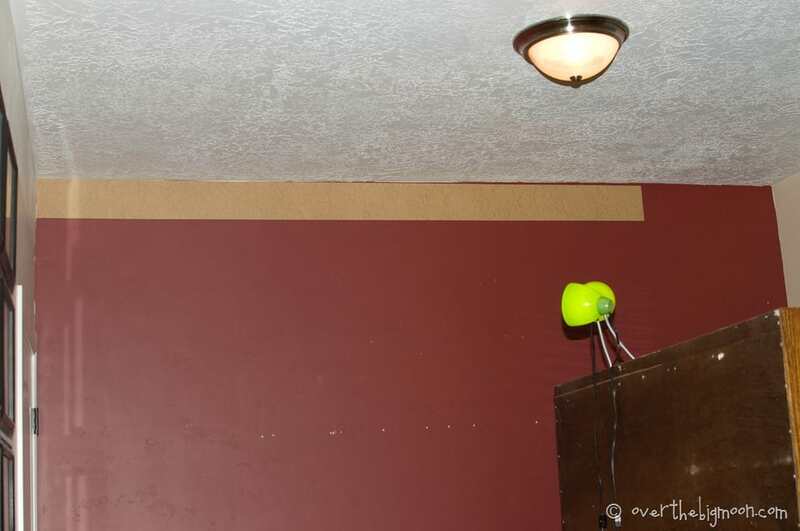 If you prepaint the wall behind the same colour as your finish, then caulking will be minimal. 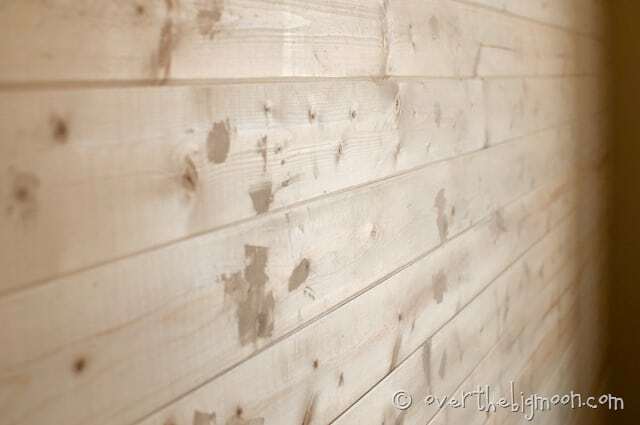 Sanding the boards outside before you put them up is an easier option. Studs are supposed to “tend” to run every 16 inches on center if the walls were framed correctly but very nice job on the shiplap.